Russell Westbrook notches 15 points, 11 rebounds and 17 assists as Oklahoma City drops Chicago. Justin Anderson scores 24 points and 12 boards to lead Atlanta in an overtime win over Milwaukee. Undrafted in 2014 NBA Draft…Signed by Boston 9/29/14…Waived by Boston 10/27/14…Signed to a 10-day contract by Philadelphia 2/5/15…Signed to a second 10-day contract by Philadelphia 2/20/15…Waived by Philadelphia 2/14/15…Signed by Portland 3/30/15…Waived by Portland 2/18/16…Signed to a 10-day contract by New Orleans 3/16/16…Re-signed by New Orleans for remainder of the 2015-16 season 3/26/16…Re-signed by New Orleans 7/22/16. 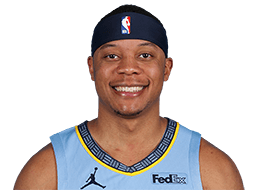 Named the 2015 D-League Most Valuable Player as well as 2015 D-League Rookie of the Year while earning All-NBA D-League First Team, NBA D-League All-Rookie First Team and NBA D-League All-Defensive Second Team honors…Named a participant in the 2015 NBA D-League Game at the Barclays Center in Brooklyn, N.Y…Appeared in 41 games (40 starts) for the Maine Red Claws, averaging 16.1 points, 9.5 assists, 7.1 rebounds and 1.7 steals…Ranked second in the D-League for APG…Recorded four triple-doubles and 11 double-doubles during the season. Appeared in 31 games while averaging 5.0 points, 2.3 rebounds and 2.4 assists. Son of Billy and Janice Frazier...Has an older brother, William, and sister, Krystal...Krystal was an All-Conference USA selection, averaging better than 13 ppg at Rice ...Four-time Academic All-Big Ten selection...Graduated in May 2013 with over a 3.1 grade-point average in supply chain and information systems in the Smeal College of Business and added a second bachelor's degree in communication arts and sciences in 2014...Served as the basketball team's representative to the Penn State Student Athlete Advisory Board and was active in the Athletic Director's Leadership Institute at Penn State.